ection. The test will reveal how fast your connection lets you upload and download data, as well as other provide information about high-speed Internet service. 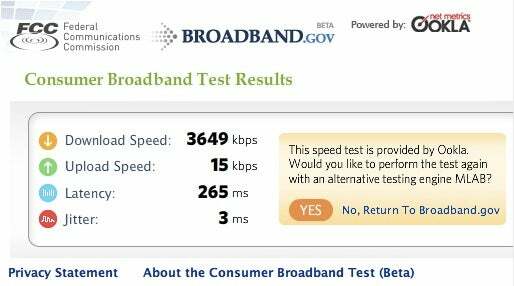 You can then compare your FCC test results with the speeds promised by your Internet service provider (ISP). You can find the test on the homepage of broadband.gov, but before you use it there are a few things you should know about the broadband test. This isn't just a free public service; the FCC will store your test data and could use some of your information to form its national broadband strategy. What do I need to use the FCC broadband test? 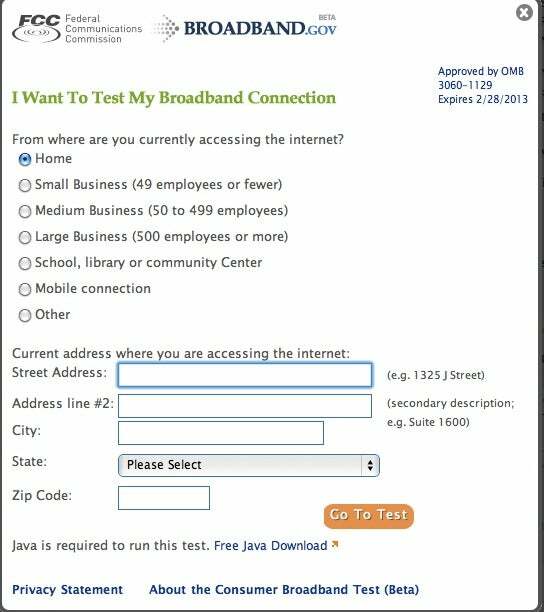 Your computer needs to have Java to run the FCC's broadband test. You can download the latest version of Java for free here. The FCC says the M-Lab test does not work with the Chrome, Opera, or Safari Web browsers. In my tests, when you use one of these browsers the FCC automatically uses the Ookla test, so you don't have to switch you browser to check your broadband speed. 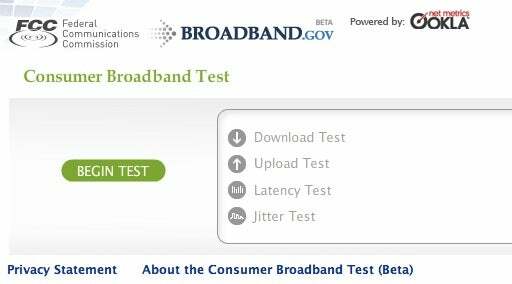 There are lots of broadband tests online. Why use the FCC's? The FCC isn't just a broadband test; the regulatory body is also collecting some of the data associated with your test. The FCC may use this information to "analyze broadband quality and availability on geographic basis," according to the FCC speed test's about page. Possible uses for this data include the FCC's National Broadband Plan and the National Broadband Map. The FCC is collecting my data? What kind of data? You also have to supply your location including your street, city, state, and ZIP code. In my tests, you only had to use the name of your street and not your specific street address or apartment number. The FCC broadband test will also record your Internet Protocol (IP) address, which could be used to discover your location; however, it's important to point out the FCC says in its broadband test privacy statement that it will not publicly disclose your location information. Nevertheless, this information will be collected and stored by the FCC and its testing partners. Your data could also be released as "aggregated and/or anonymized data," according to the privacy statement. Do other online broadband tests record this information? I didn't find any other free tests that ask you for your address, but other tests do collect other information similar to the FCC. Speedtest.net, which is run by FCC broadband testing partner Ookla, collects and stores your IP address, ISP, the Web browser you used, what time you visited the site, and which pages you visited. I couldn't find any information about what Ookla does with the information it collects through Speedtest.net. Thinkbroadband's speed test records similar information, and says it may even share that information with your ISP to troubleshoot problems and improve your ISP's service. This may sound scary, but remember, almost every Website you visit records your IP, Web browser, time of visit, and the pages you visited. It's just the way the Web works. Jitter is used to test the consistentcy of your latency (data packet round trip). If your Jitter result is too high, you may have significant problems with data-heavy applications like Skype or other voice over Internet Protocol (VoIP) programs and gaming. "For high quality video conferencing, less than 20 ms [milliseconds] of jitter is best. Latency under 30 ms is excellent," according to Muniwireless.com. So there you have it, everything you need to know about the FCC's new broadband speed test. Are you planning on giving it a try? Remember, you're not only helping yourself, but also providing statistical data to the FCC. It's up to you to decide whether you're comfortable with that. If you want to use the FCC's broadband test visit http://www.broadband.gov/ and click on "I want to test my connection quality."